« “The cows are in the field!”–something’s up…. Peeled a garlic clove, sliced it thin and deseeded a small dried red chili. Poured two tablespoons of olive oil into a sauté pan, added the garlic and chili and let the garlic colour lightly. Roughly cut up the chard and added it to the pan with a little salt, turning it in the garlicky oil. I covered the pan and cooked the chard on a low flame turning it now and then to prevent it burning for about 5 minutes until it was cooked through. 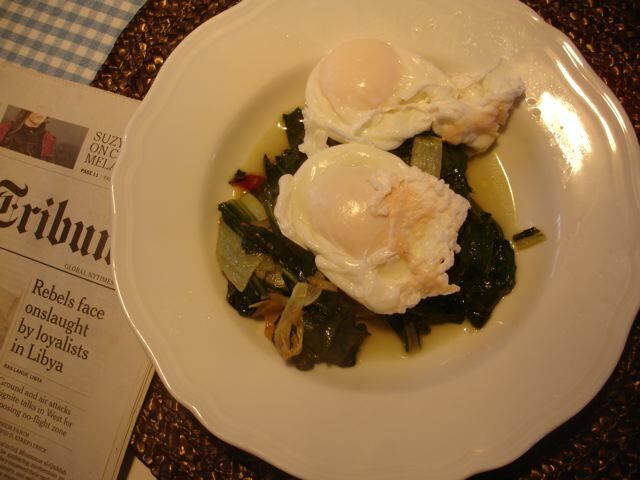 Spooned off the excess liquid before making a nest of the chard on a plate ready to receive the eggs. I poached the two eggs, drained them well and placed them in the nest and hey presto!–a light lunch. I could have had a small salad with it but I didn’t. First separate the leaves from the stalks of the chard or spinach, wash them and shake as much water as possible from them, before chopping and adding them to the pan.